If the viral Buzzfeed-style personality quizzes are any indication, we are collectively obsessed with the idea of defining and knowing ourselves and our unique place in the world. But what we're finding is this: knowing which Harry Potter character you are is easy, but actually knowing yourself isn't as simple as just checking a few boxes on an online quiz. For readers who long to dig deeper into what makes them uniquely them (and why that matters), popular blogger Anne Bogel has done the hard part--collecting, exploring, and explaining the most popular personality frameworks, such as Myers-Briggs, StrengthsFinder, Enneagram, and others. She explains to readers the life-changing insights that can be gained from each and shares specific, practical real-life applications across all facets of life, including love and marriage, productivity, parenting, the workplace, and spiritual life. In her friendly, relatable style, Bogel shares engaging personal stories that show firsthand how understanding personality can revolutionize the way we live, love, work, and pray. "This is the book I didn't even know I was waiting for. I can't wait to share it with everyone I know." --Emily P. Freeman, Wall Street Journal bestselling author of Simply Tuesday If the viral personality quizzes strewn about our social media accounts are any indication, we are collectively obsessed with the idea of defining and knowing ourselves and our unique places in the world. But what we're finding is this: knowing which famous movie character you are is easy, but actually knowing yourself isn't as simple as just checking a few boxes on an online quiz. 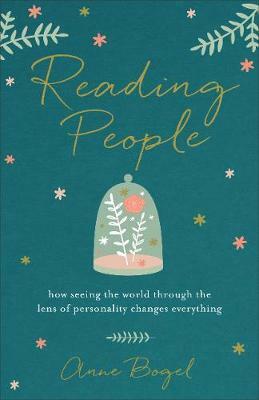 Backed by extensive research and illustrated with engaging stories, Reading People explains what makes you uniquely you, what makes the people in your life uniquely them, and why it all matters. Popular blogger Anne Bogel makes it easy. In this fascinating book, she collects, explores, and explains the most popular personality frameworks, such as the Myers-Briggs Type Indicator, StrengthsFinder, Enneagram, and others. She shares the life-changing insights that can be gained from each, along with practical applications across all facets of life, including love and marriage, productivity, parenting, the workplace, and spiritual life. Want to revolutionize the way you live, love, work, and pray? Understanding personality is the first step! "Anne Bogel is a smart, savvy, kindhearted woman of wisdom whose words continually have me nodding my head in agreement and saying, 'I thought I was the only one!' The world is better because of her insight." --Tsh Oxenreider, author of At Home in the World and Notes from a Blue Bike "I absolutely adored Reading People. Understanding more about how people are wired through the research, data, and examples Anne gives is helping me in every relationship. Truly, I feel like I'm a better wife, mom, employer, friend, and person for having read this book." --Crystal Paine, New York Times bestselling author of Say Goodbye to Survival Mode and founder of MoneySavingMom.com Anne Bogel is the creator of the popular blog Modern Mrs Darcy and the podcast What Should I Read Next? Her popular book lists and reading guides have established Bogel as a tastemaker among readers, authors, and publishers. Bogel lives in Louisville, Kentucky. You can also find her on Facebook, Twitter, Pinterest, and Instagram.